This letter is in regards to some mistakes on the website about CAP 4-3-4. I've discussed this with Warren Smith, and he agrees with me that he was mistaken (see letter below). I've also CC'd Warren so that if he does disagree with what I say in this letter, he can contact me, and we'll discuss it. I was with 4-3-4 most of my tour, and I'm sure of the locations I've highlighted on the attached map. Orange highlights were 4-3-4 AO at least May 1969 to Dec, 1969. Yellow highlights were 4-3-4 AO Dec 1969 to June 1970. This agrees with the map and my location of 4-3-4. Warren thought that 4-3-4 was located in Van Hoa. He was incorrect. 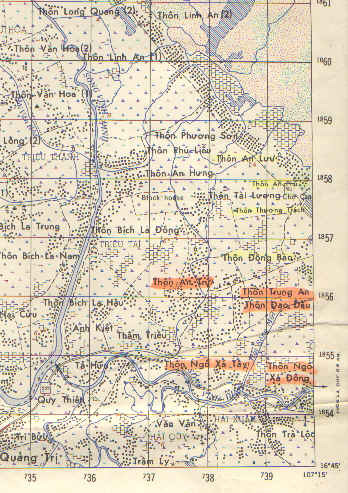 I don't know which CAP was located at Van Hoa, but it definitly wasn't 4-3-4. If you can find the time ( I know it's in short supply ), please make the corrections. If I can be any help clarifying these locations, please don't hesitate to contact me.